Global tourism is a trillion-dollar industry. As the world has become richer and air travel cheaper, it’s little surprise that the industry contributes significantly to greenhouse-gas emissions. So far, however, estimates of the sector’s emissions haven’t been good enough. In 2008, the World Trade Organization (WTO) said the best figure it could find was that tourism is responsible for about 3 percent of global carbon dioxide emissions. But the intergovernmental group wrote in its report that this estimate didn’t include emissions from food, accommodation, or shopping, and so the true figure should be higher. The question is: just how much higher? Ten years later, Arunima Malik of the University of Sydney and her colleagues may finally have an answer. In the most comprehensive analysis of the industry sector yet, published in Nature Climate Change, they estimate the global tourism’s carbon footprint is likely to be about 8 percent of all emissions—more than double the previous estimate. To come to this conclusion, they combined three large international databases and included all types of greenhouses gases (not just carbon dioxide as the previous estimate had done). The definition of tourism used by these databases is: someone “taking a trip…to a place outside his/her usual environment for less than a year and for a purpose other than being employed by a resident entity there.” That means it excludes the emissions of migrants moving to take a job, but does include business trips. When both direct emissions (such those produced by a given airplane ride) and indirect emissions (such as those released in the construction of the hotel) are included, the total comes to nearly 4.3 billion metric tons emitted each year. The burden of these emissions is unevenly distributed throughout the world. 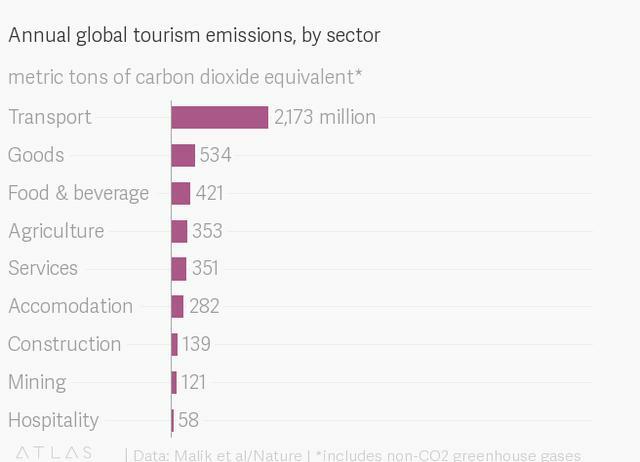 Tourism is an expensive activity, and thus the more rich people in a country the higher its emissions. The relationship between wealth and tourism is not linear. That is, the demand for tourism is growing at a faster rate than that at which the world is getting richer, and is expected to remain one of the fastest-growing industries over the next few decades. Meanwhile, initiatives meant to help the tourism industry cut its emissions, such as encouraging tourists to travel shorter distances or incentivizing tourism operators to become more energy efficient, haven’t helped cut emissions fast enough, according to the WTO. Malik and her colleagues conclude that, given the industry’s outsized impact global emissions and with no slowdown of tourism in sight, the only way to bring it under control is some form of carbon-pricing scheme that will force tourists to understand the true cost of their leisure. PreviousTravelling the world: Just how do you get the money?